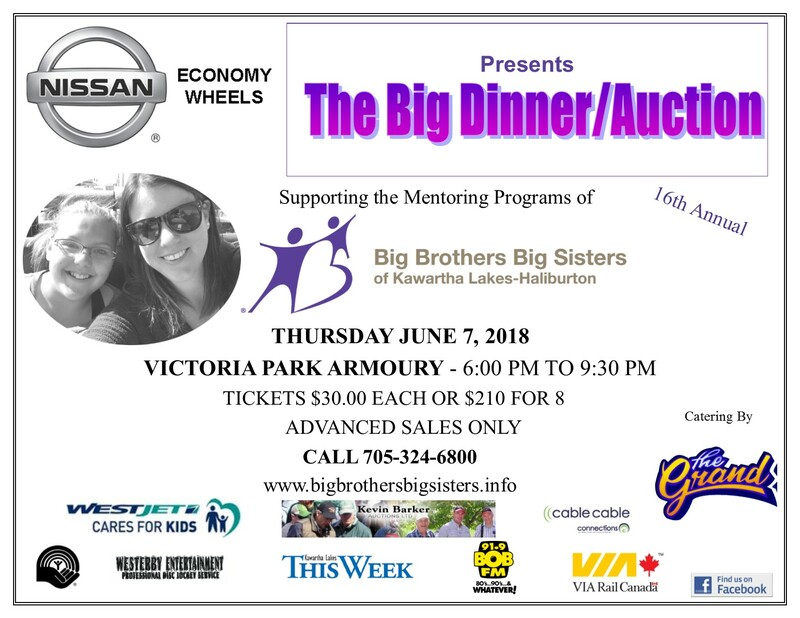 Big Brothers Big Sisters of Kawartha Lakes-Haliburton and Economy Wheels-Nissan are teaming up to bring you the 16th Dinner/Auction in support of mentoring programs. This event is one of the organizations main fundraising initiatives and sustainable mentoring programs depend on its success. The organization is reaching out to the community and asking people to attend this event to ensure that it can continue to operate and provide important mentoring programs to children aged 6-16 years old. The event is being held on Thursday June 7, 2018 at the Victoria Park Armoury. The doors open at 6:00 pm, dinner is served at 7:00 pm and the night will come to a close at 9:30 pm. A cash bar is also available. The BIG in the event name symbolizes the big things that the organization and its volunteers can accomplish through relationships between children and caring adult mentors, the big impact the programs have on the community, as well as some of the big items available at the event. Some of the items available include a WestJet Cares for Kids voucher for two to anywhere West Jet flies, a VIA Rail credit of $1000, a 2019 Camp Can Aqua 2 week spot for a child, toys, tools, home decor, clothing and many gift certificates. The organization says that the business community has always been very generous and there should be 150 items available through the door prizes, silent auction and live auction. Any local business that would like to contribute to this event can contact the organization to discuss how they can assist. Kevin Barker Auctions will be handling the live auction portion once again. The organization would like to see a great turnout for the best deal in town. This event is very affordable at $30 for a ticket or businesses, families or groups of friends can purchase a table of 8 for $210. Tickets must be purchased in advance for the event. The meal will be catered by The Grand this year. Dave Illman and Julie Corlett of BOB FM will be the emcees for the evening and the organizations long time supporters, Westerby Entertainment, will provide the dinner music and audio/video support. Jim DeFlorio, Executive Director, says he can’t stress enough how much the organization depends on the community to help us to provide mentoring programs on an annual basis. Big Brothers Big Sisters is a true community-based organization that can only provide a level of service that is based on the annual support we receive through our events, general donations and the United Way. DeFlorio, urges you to come out and enjoy the evening if you think that mentoring programs are an important part of our community! Call Big Brothers Big Sisters of Kawartha Lakes-Haliburton at 705-324-6800 to purchase your tickets. You can also visit www.bigbrothersbigsisters.info for more information on the organization and volunteer opportunities.